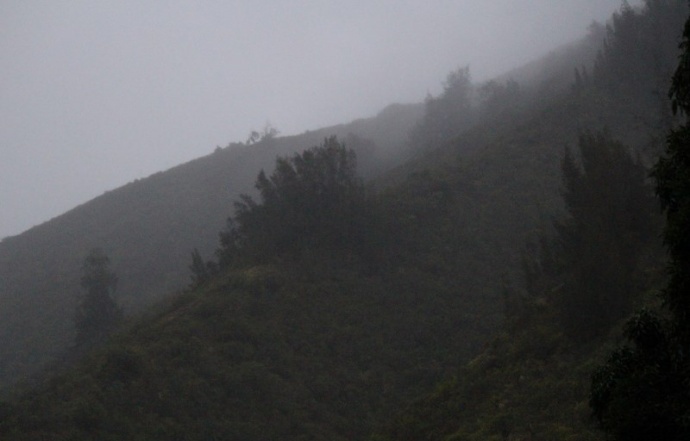 Rain was reported over the windward Central Maui area at ʻĪao Valley State Park as Maui awaits the impacts of Tropical Storm Flossie. Photo by Wendy Osher, 7/28/13. The state Department of Land and Natural Resources, Division of Forestry and Wildlife announced the closure this morning of state parks and trails on Maui as the effects of Tropical Storm Flossie near the island. “We advise that hikers, campers or hunters should avoid trails, streams and back-country areas under these conditions,” said William J. Aila, Jr., DLNR chairperson in a department press release. “Due to the high surf and heavy rains that may occur under storm conditions the public is urged to avoid shorelines and areas near streams,” he said. Haleakalā National Park will be also be closed until Wednesday, July 31, at 11:59 p.m. due to storm conditions caused by Tropical Storm Flossie. For NPS updates, the public can call (808) 572-4400. Also, the National Park Service is reportedly clearing people from the Kīipahulu area of the park with plans to have the area closed by 11:30 this morning. State officials say the closures will remain in effect until staff can inspect the condition and safety of the trails once the storm system has passed. DLNR is also advising the public to avoid entering forest areas on all islands, starting today. “Storm conditions can trap recreationalists by blocking trails and roads from flash floods and falling trees. Falling rocks, falling trees and landslides pose additional threats to people in the forest reserves,” said DLNR officials.